Every family has secrets. They may not admit it but they do. My family just happens to have more than most. That happens when you have a large family. A family that is “blended” from different parents and adoption can have some stories. Add in-laws and the secrets can get way out of control. My birth was one of the bigger ones. Yes, I was an illegitimate child. According to “legend” my grandmother tried to pass me off as a neighbour’s kid that my Mom was babysitting. Let me just say my Mother was a great baby sitter. Don’t ask me about my grandmother. Perhaps the longest kept secret (at least for me) was who my biological father was. I found out when I was in my early 20s and actually met him just before my 27th birthday. Of course we have had our share of drug users and abusers. I believe every family does. Unfortunately, we’ve also had family members behind bars. No this one is not real. 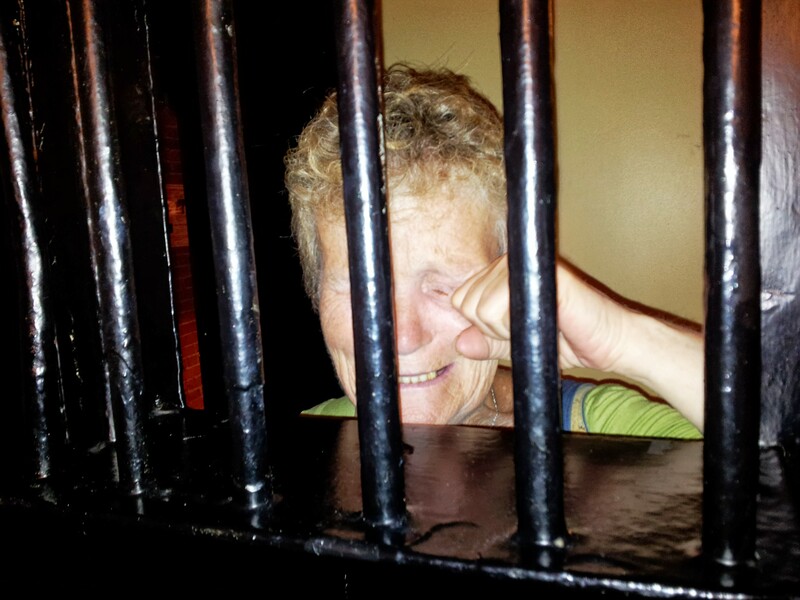 In this case we were exploring an old jail in Cobourg, ON that has been turned into a restaurant. Yes, all of these were some of the worse kept secrets in history. There is one secret, though, that has been kept secret until just recently. It’s absolutely, hands down the best kept secret in all of my family. Ralph’s Plum Jam. As a matter of fact when I started this post in 2014 I turned to He-Who and said, “I need that recipe for your brother’s jam to finish this post.” He looked at me with a blank stare. Me: “You told me last week he finally gave in and gave it to Keri-Lynn (He-Who’s daughter)”. I will not burden you with the rest of that conversation. Let’s just say it wasn’t pretty. Four years later I still do not have the recipe, Ralph has moved away from his plum trees and we are always on the search for plum jam. I hear about families, Michelle. My mother’s death unearthed more family drama than you’d find on a daytime soap. Thanks Hook. Yes, my Mom’s death did the same. I wish I could tell you it will end but it never seems to. That can’t be the end of the story???? I want more!! Who leaves you hanging there??? Come on Seester!!!! Do you have a plum jam recipe? That’s what it’s all about. You could just send us plum jam. That’s what Ralph use to do. It sounds like you’ll need to do a kidnapping ransom-type situation. Good luck! Another great post, Michelle. Some of our family secrets were unearthed thanks to Ancestry.ca and one mysterious old photo. I remember you telling me about it. With our mix mash of family I’m afraid that my family tree has been a hard one. I did get the DNA test done though. You must not give up. That recipe needs to be shared! Besides that, don’t we all have family secrets one way or another.